This tutorial is the third in a series of 12 which teach you how to build MVC 5 applications using Entity Framework for data access and Visual Basic. This tutorial explores how to add sorting, filtering and paging to MVC 5 Views using the Entity Framework. You will also look at implementing simple Grouping. This tutorial series teaches you how to create ASP.NET MVC 5 applications using the Entity Framework 6 and Visual Studio 2013 Express for Web. This tutorial uses the Code First workflow. For information about how to choose between Code First, Database First, and Model First, see Entity Framework Development Workflows. 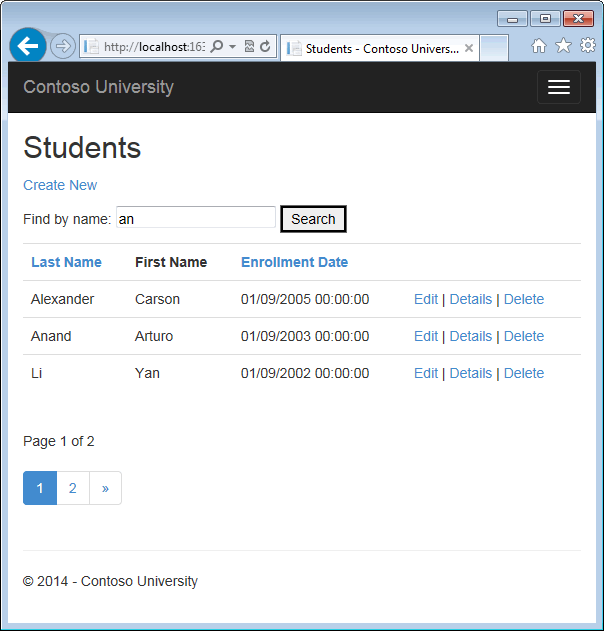 In the previous tutorial you implemented a set of web pages for basic CRUD operations for Student entities. 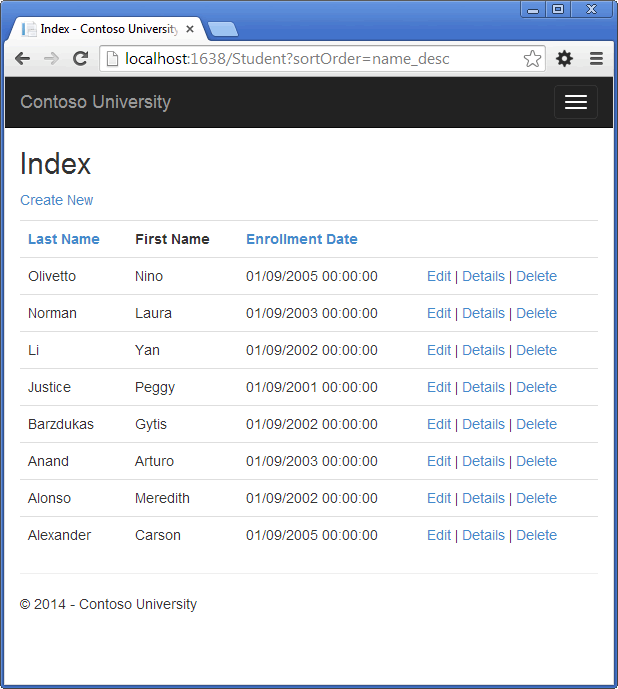 In this tutorial you'll add sorting, filtering, and paging functionality to the Students Index page. You'll also create a page that does simple grouping. The following illustration shows what the page will look like when you're done. The column headings are links that the user can click to sort by that column. Clicking a column heading repeatedly toggles between ascending and descending sort order. 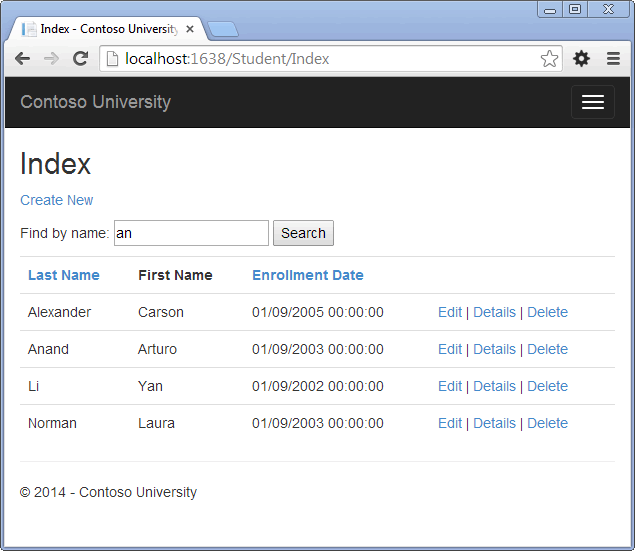 To add sorting to the Student Index page, you'll change the Index method of the Student controller and add code to the Student Index view. This code receives a sortOrder parameter from the query string in the URL. The query string value is provided by ASP.NET MVC as a parameter to the action method. The parameter will be a string that's either "Name" or "Date", optionally followed by an underscore and the string "desc" to specify descending order. The default sort order is ascending. The first time the Index page is requested, there's no query string. The students are displayed in ascending order by LastName, which is the default as established by the fall-through case in the Select Case statement. When the user clicks a column heading hyperlink, the appropriate sortOrder value is provided in the query string. The method uses LINQ to Entities to specify the column to sort by. The code creates an IQueryable variable before the Select Case statement, modifies it in the Select Case statement, and calls the ToList method after the Select Case statement. When you create and modify IQueryable variables, no query is sent to the database. The query is not executed until you convert the IQueryable object into a collection by calling a method such as ToList. Therefore, this code results in a single query that is not executed until the Return View statement. As an alternative to writing different LINQ statements for each sort order, you can dynamically create a LINQ statement. For information about dynamic LINQ, see Dynamic LINQ. This code uses the information in the ViewBag properties to set up hyperlinks with the appropriate query string values. Run the page and click the Last Name and Enrollment Date column headings to verify that sorting works. 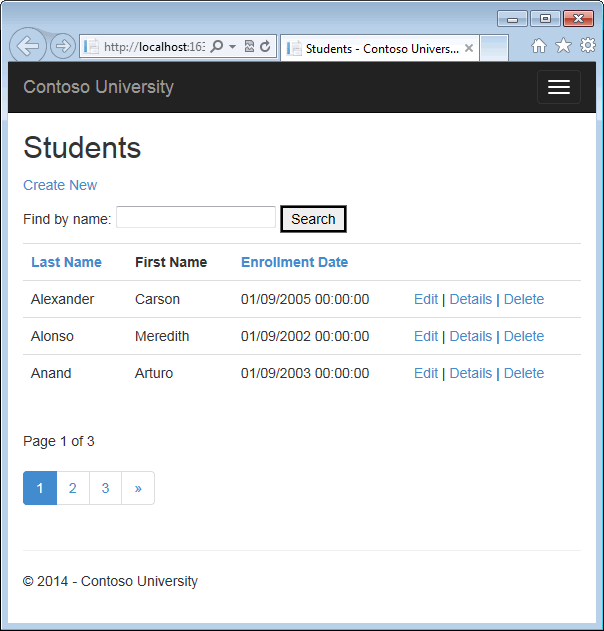 After you click the Last Name heading, students are displayed in descending last name order. To add filtering to the Students Index page, you'll add a text box and a submit button to the view and make corresponding changes in the Index method. The text box will let you enter a string to search for in the first name and last name fields. You've added a searchString parameter to the Index method. You've also added to the LINQ statement a Where clause that selects only students whose first name or last name contains the search string. The search string value is received from a text box that you'll add to the Index view.The statement that adds the where clause is executed only if there's a value to search for. Note In many cases you can call the same method either on an Entity Framework entity set or as an extension method on an in-memory collection. The results are normally the same but in some cases may be different. Null handling may also be different for different database providers or when you use an IQueryable object compared to when you use an IEnumerable collection. For example, in some scenarios a Where condition such as table.Column <> 0 may not return columns that have null as the value. For more information, see Incorrect handling of null variables in 'where' clause. In Views\Student\Index.vbhtml, add the highlighted code immediately before the opening table tag in order to create a caption, a text box, and a Search button. Run the page, enter a search string, and click Search to verify that filtering is working. Notice the URL doesn't contain the "an" search string, which means that if you bookmark this page, you won't get the filtered list when you use the bookmark. You'll change the Search button to use query strings for filter criteria later in the tutorial. 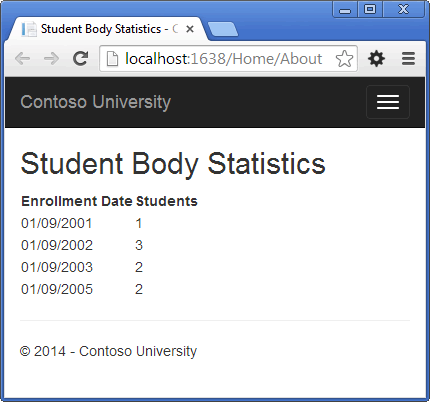 To add paging to the Students Index page, you'll start by installing the PagedList.Mvc NuGet package. Then you'll make additional changes in the Index method and add paging links to the Index view. PagedList.Mvc is one of many good paging and sorting packages for ASP.NET MVC, and its use here is intended only as an example, not as a recommendation for it over other options. The following illustration shows the paging links. The NuGet PagedList.Mvc package automatically installs the PagedList package as a dependency. The PagedList package installs a PagedList collection type and extension methods for IQueryable and IEnumerable collections. The extension methods create a single page of data in a PagedList collection out of your IQueryable or IEnumerable, and the PagedList collection provides several properties and methods that facilitate paging. The PagedList.Mvc package installs a paging helper that displays the paging buttons. From the Tools menu, select Library Package Manager and then Package Manager Console. The first time the page is displayed, or if the user hasn't clicked a paging or sorting link, all the parameters will be null. If a paging link is clicked, the page variable will contain the page number to display. Another property, ViewBag.CurrentFilter, provides the view with the current filter string. This value must be included in the paging links in order to maintain the filter settings during paging, and it must be restored to the text box when the page is redisplayed. If the search string is changed during paging, the page has to be reset to 1, because the new filter can result in different data to display. The search string is changed when a value is entered in the text box and the submit button is pressed. In that case, the searchString parameter is not null. The ToPagedList method takes a page number. The If operator called with two arguments is the equivalent to the C# null-coalescing operator. The operator returns the first non-null value from the two arguments. If page is Nothing, 1 is returned, otherwise the value of page is returned. In Views\Student\Index.vbhtml, replace the existing code with the following code. The changes are highlighted. The @ModelType statement at the top of the page specifies that the view now gets a PagedList object instead of a List object. The Imports statement for PagedList.Mvc gives access to the MVC helper for the paging buttons. The code uses an overload of BeginForm that allows it to specify FormMethod.Get. The default BeginForm submits form data with a POST, which means that parameters are passed in the HTTP message body and not in the URL as query strings. When you specify HTTP GET, the form data is passed in the URL as query strings, which enables users to bookmark the URL. The W3C guidelines for the use of HTTP GET recommend that you should use GET when the action does not result in an update. The text box is initialized with the current search string so when you click a new page you can see the current search string. The current page and total number of pages are displayed. The PagedListPager helper provides a number of options that you can customize, including URLs and styling. For more information, see TroyGoode/PagedList on the GitHub site. Click the paging links in different sort orders to make sure paging works. Then enter a search string and try paging again to verify that paging also works correctly with sorting and filtering. Create a view model class for the data that you need to pass to the view. Modify the About method in the Home controller. Public Property EnrollmentDate As DateTime? ViewBag.Title = "Student Body Statistics"
Run the app and click the About link. The count of students for each enrollment date is displayed in a table. In this tutorial you've seen how to create a data model and implement basic CRUD, sorting, filtering, paging, and grouping functionality. In the next tutorial you'll begin looking at more advanced topics by expanding the data model.